Paleo Pumpkin Chili with Beef, Peppers, and Olives is a delicious idea for dinner on Halloween night! And this tasty no-bean chili is low-carb, Whole 30 approved, South Beach Diet friendly, and low glycemic. Use Chili Recipes to find more recipes like this one. 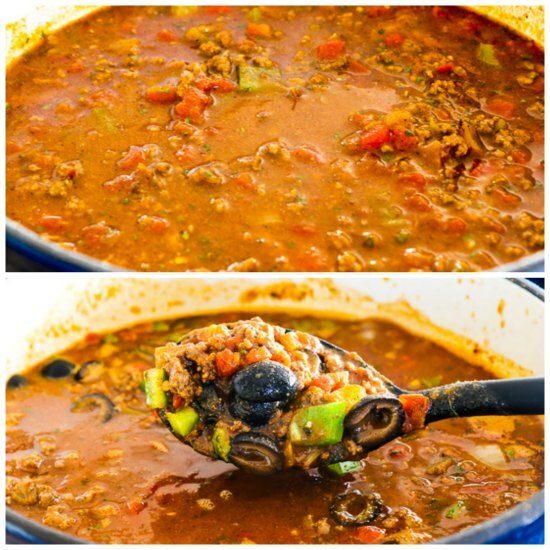 Click here to PIN Paleo Pumpkin Chili with Beef, Peppers, and Olives! Paleo and Low-Carb Pumpkin Chili! There’s already a recipe on the blog for CrockPot Pumpkin Chili and it’s been a hit. In fact my nephew Matt and his wife Lindy won a chili-making contest with that chili recipe. But my CrockPot Pumpkin Chili uses three cans of beans and recently I realized that it wasn’t going to work for people who are eating low-carb, Paleo, or Whole 30. And I’m not even sure what made me think about it, but once the idea popped into my mind for a no-bean chili with pumpkin, I had to try it and see what I could come up with! And this Paleo Pumpkin Chili with Beef, Peppers, and Olives was really delicious! 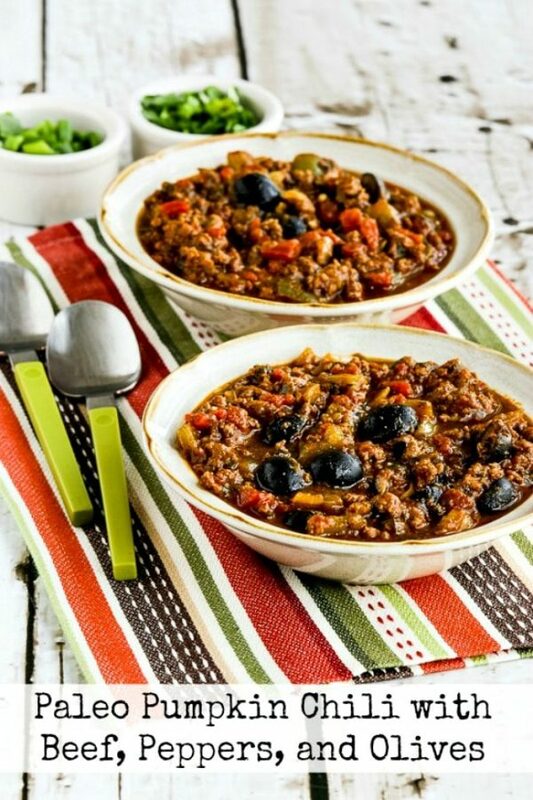 It has lots of ground beef, chopped green pepper, diced green chiles, and olives, and just one can of pumpkin puree so there’s not a super strong pumpkin flavor, but the pumpkin gives it a slight sweetness that’s delicious with the spices that make it taste like chili. I’m reminding you about this tasty no-bean chili recipe as a Halloween dinner option, and Halloween is two days away; I’m sure you’re aware of that if you have kids or grandkids! I think this would make a great dinner for Halloween night. The recipe makes quite a bit, so you might even have some left over to put in the freezer for another cold evening when chili sounds good! Brown the ground beef well, season with salt and fresh-ground black pepper, and add it to the soup pot. Saute the chopped green pepper and chopped onion until they’re starting to soften; then add the minced garlic and diced green chiles and cook 2 minutes more. Add all the spices and dried herbs and cook 1-2 minutes more, then add that to the soup pot. 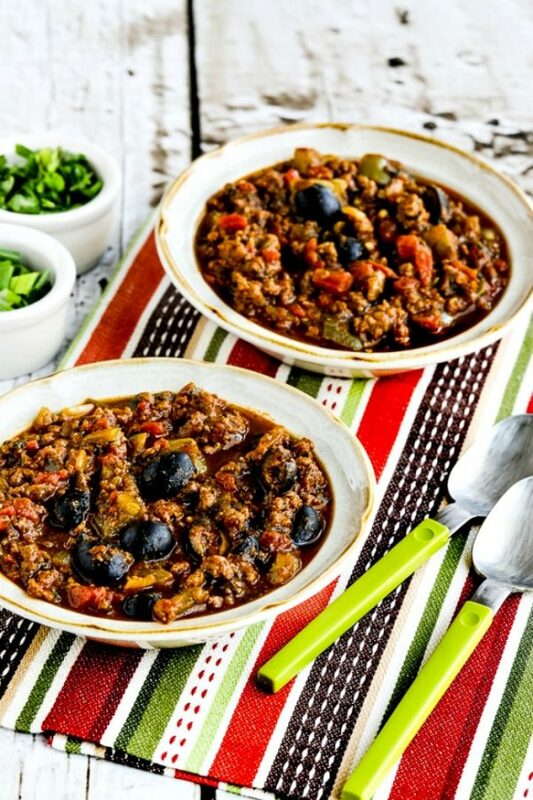 Paleo Pumpkin Chili with Beef, Peppers, and Olives would be delicious for Halloween night! Heat 2 tsp. oil in a large non-stick frying pan. (I used my favorite Green Pan for this.) Add the ground beef and brown well over medium-high heat, stirring often and breaking apart with the turner (or a potato masher) as it cooks. When beef is nicely browned, season it with salt and fresh ground black pepper to taste and add it to a large soup pot that’s big enough to hold all the ingredients. Add the other 2 tsp. olive oil to the frying pan, add the chopped onion and green pepper, and cook over medium heat until the vegetables start to soften, about 3-4 minutes. Then add the minced garlic and diced green chiles (with juice) and cook about 2 minutes more. 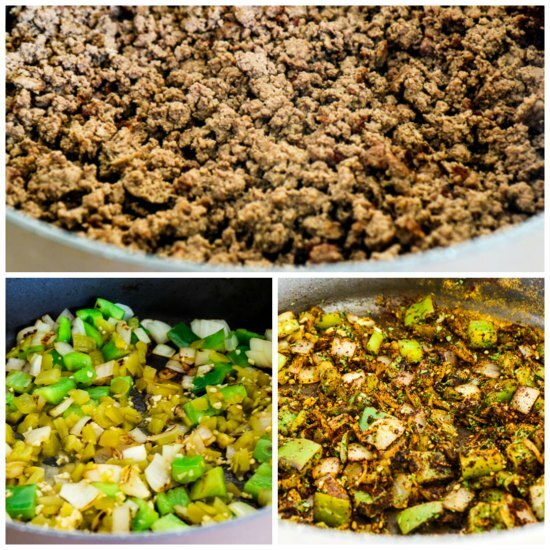 Add theSpike Seasoning, ground cumin, chili powder, dried cilantro (if using), ground Ancho chiles (or more chili powder) and dried oregano and cook a minute or two longer. Then add the onion-pepper-spice mixture to the soup pot. Deglaze the frying pan with one can of beef broth and add it the soup pot with the other can beef broth, diced tomatoes plus juice, the pumpkin, and the olive halves. About 20 minutes before you want to serve, add the finely chopped cilantro, thinly sliced green onions, and Green Tabasco sauce. Let chili simmer 10 minutes more with those ingredients added. Serve hot, with additional chopped cilantro, sliced green onion, and more Green Tabasco Sauce to add at the table if desired. This freezes well, and can be easily reheat in the microwave or in a pan on the stove. Recipe created by Kalyn and Jake and inspired by CrockPot Pumpkin Chili. 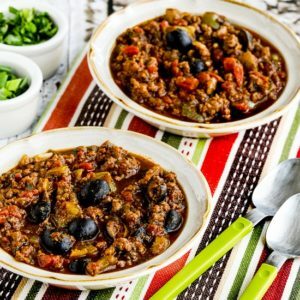 Paleo Pumpkin Chili with Beef, Peppers, and Olives is Paleo and Whole 30 approved as long as you use canned pumpkin that is pure pumpkin (and substitute an approved seasoning blend), but using pumpkin limits it to phase two or three for the South Beach Diet. Most ingredients are low in carbs or low-glycemic so this chili should be approved for most low-carb and low-glycemic eating plans. Use the Diet Type Index page to find more recipes suitable for a specific eating plan. You might also like to Follow Kalyn’s Kitchen on Pinterest to see all the good recipes I’m sharing there.